New Believe Facebook player now available! Listening to music on Facebook is not an easy job. There are certain technical restrictions built into the platform, designed to limit music streaming tools within the website. Therefore, we have worked with Facebook to develop a player that is secure and efficient and will allow you and your fans to share your music on Facebook, on users’ walls, via the internal messaging and more. This tool is available free of charge, to make use of it, simply set up your BelieveBand profile from your Believe Backstage area. Go to your Facebook Fan Page and click “edit page”. To set up the player, enter your album’s UPC code or search by the artist’s name, when you have selected the album you wish to play, click “save”. There you go! 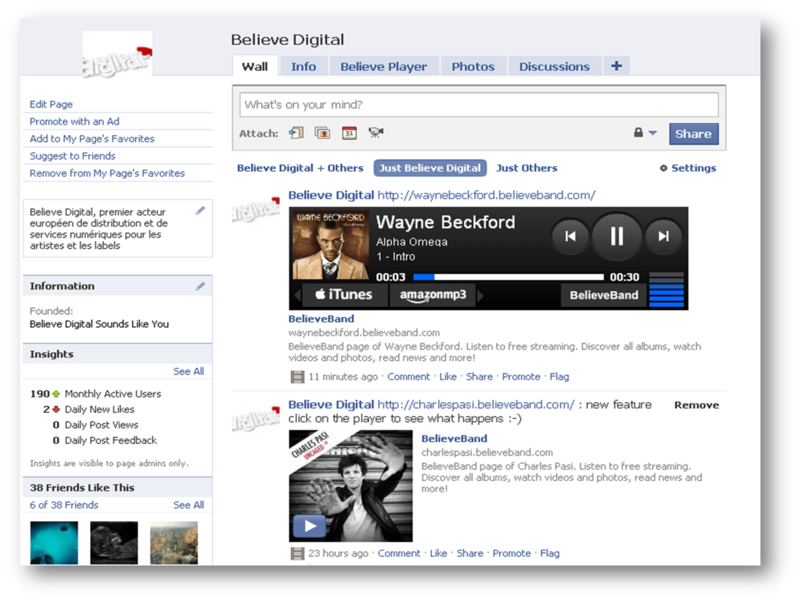 The Believe Player has now been installed on your Facebook page.